Pen drive or thumb drive is one of the most convenient way to save your data now a days but it is the most easy way for spreading virus from one computer to another. Pen drive usually gets infected by autorun viruses, these viruses are not easy to remove and may corrupt your precious data in pen drive. So, Here is a free tool to immunize your before it gets infected and spread infection to another computer. How It Works: Most virus spread from pen drive by "autorun" files from one computer to another. You can remove this virus by using "Autorun eater" but it may delete some important data from your pen drive or data on pen drive may become corrupt. 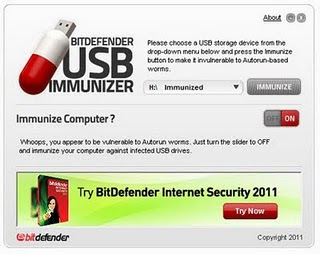 So, why don't you immunize it before getting infection :) Now "BitDefender" created a free portable tool which protects your pen drive from viruses or Immunizes it. First, run this tool > Select your pen drive > Click Immunize > Done. Now your pen drive is immunize against all type of autorun viruses. It is just 1.12 Mb in size , No need to install, just unzip it and it is ready to use.